I have a seafood allergy. The reason I mention that is that Sushi Striker works of the premise that sushi is so delectable that it's literally worth going to war over. That's a bold claim I could never verify myself, so I'm just going to have to take Sushi Striker on face value. Why couldn't it have been melon pan? I'd go to war over melon pan. That would have been so much more relatable. 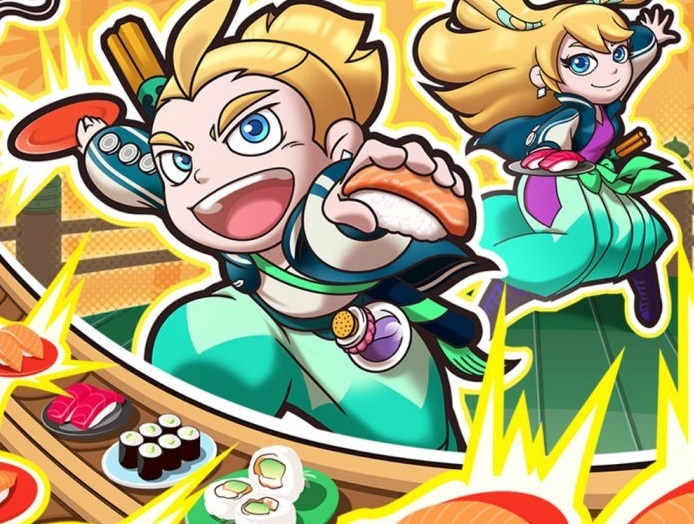 Anyhow, choice of food aside, Sushi Striker is the most delightful little action puzzle game. It's not something you'll be playing months and years down the track, but for its runtime it's bright, charming, silly, and overwhelmingly good fun. I might not be able to eat sushi, but I play so many much more serious games that I do need something like this to help break up my diet. 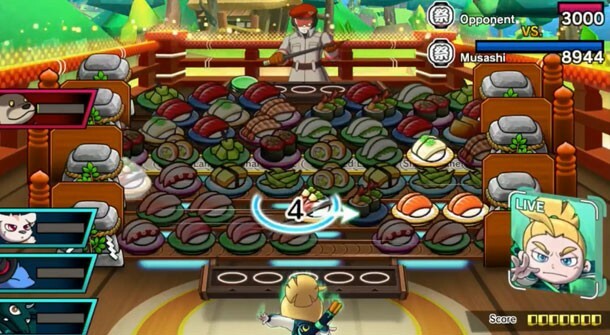 In Sushi Striker, you play as a young boy or girl in a world in which an evil empire has banned people from eating sushi. But, with a true revolutionary spirit, there's an underground movement where people continue to make and share sushi with the help of little sprites that contain the power of sushi within them. Our hero meets one of these underground sushi rebels, and is introduced to the delights that is sushi. But then the empire shows up and kidnaps that rebel, and our hero sets off on a quest to rescue him. 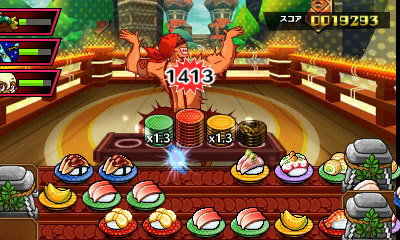 See, people imbued with the power of sushi can also fight using plates of - you guessed it - sushi. And that's where Sushi Striker's gameplay comes from. With each battle that your character finds themselves in, they get transported, along with their rival, to a special arena, in which there are two sets of sushi conveyor belts. On those belts are plates of sushi, with each plate having a different colour. Your job is to match as many of the same colour sushi plates together, which causes stacks of plates to appear on your side. You can then toss the stacks at your opponent, and naturally, the larger the stack, the more damage it will do. Other modifiers include (but are not limited to) attacking your opponent with a number of the same sushi plates in a row (combos), and the sushi sprites that you take into battle. Each of those little fellows have unique skills which are super-limited in use, but can really turn the tide in battle. Finally, there's an experience system which will allow the hero to do more damage and take more punishment, and his/her sprites to develop better abilities. Higher level sprites also mean that better quality sushi will show up as you play. There's plenty to manage in this combat system, but thankfully the game takes an almost too slow approach to getting you across it all, so you'll never be overwhelmed with trying to understand Sushi Striker's systems as you play. Sushi Striker is delightfully frenetic, and certainly the most original spin we've seen on the "match-3" puzzler in quite some time. Plates move across the conveyor belt at a good clip, so to get the really good combos you need to think and react quickly. It's also an oddly meditative game because your opponent will be constantly attacking you, and it's easy to get distracted by what's happening on the other side of the screen. But you need to resist that and really learn to focus on what you're doing. There aren't too many games that are able to force you to concentrate quite like that. It's a nice touch. Sadly the single player mode does become a grind. It's obvious that it will from the outset, since the setup promises a very light, breezy experience, with a plot that couldn't possibly be worth stretching out over many hours, but in practice the developers of the game clearly felt the need to "prove its value" in an era where free-to-play puzzle games have hundreds of levels. 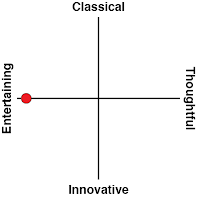 Unfortunately it means what is initially a delightful and simple story is stretched far too far. What's worse, the dreaded three "star" scoring system which has become standard in free-to-play puzzle games pops its ugly head into the picture. This was pioneered by Angry Birds way back when as a way of improving the longevity of the game by getting players to replay levels they've already completed by imposing strict conditions for earning "stars" such that people will generally miss one or more on the first attempt. Those stars don't actually add anything to the experience, though. From a development point of view it's a cheap way to play on a person's desire to "complete" a game without offering anything in exchange; and it has always felt incredibly exploitative to me. 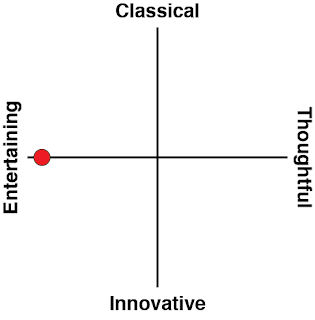 What's worse is that Sushi Striker also has a letter grading based on how well you perform in a level, and getting "S" ratings in itself is a cause to replay levels, so the star system is little more than an irritating redundancy. Still, it's hard not to be charmed by something that has this much colour and energy going for it. Cut scenes are a delight in how ridiculously over-the-top they are, with rarely a line which isn't driving hard to make you laugh. The game has an appropriately Japanese sense of the surreal and weird, though I do wish there was a Japanese voice option, because the actors that they got for this one grate on my nerves for their over-enthusiastic morning cartoon-style performance. Sushi Striker's real secret weapon, however, is in the multiplayer. 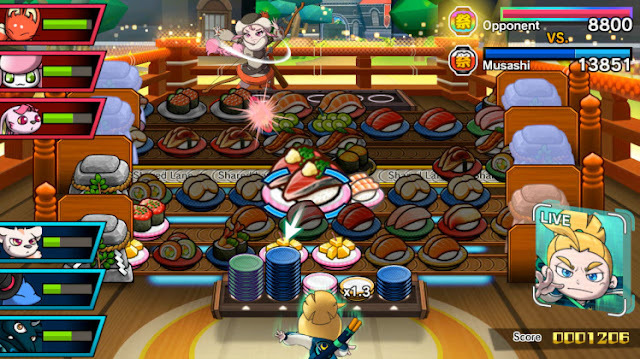 The mix of skills offered by the sushi sprites adds plenty of depth and strategy to character development, and coupled with the quick thinking and dynamism of the in-game action, there's a lot of skill involved in being good at Sushi Striker, such that winning a multiplayer game is incredibly satisfying. Whether there are enough people to sustain a community for something as niche as this, however, remains to be seen. As far as pure entertainment goes, it's hard to look past Sushi Striker. The manic energy and silly sense of humour combine with match-3 gameplay that is far more nuanced than is the norm for the genre, and while I could take a hard pass on the way it appropriates some of the more irritating features of the free-to-play trends that dominate puzzle games, for the most part Sushi Striker is an end-to-end delight that probably didn't deserve to be localised at all, but I'm glad it has been.